1280, Used Rims, 13X5, 4 LUG, 100MM, 81-87, CHEV, 1000, CHEVETTE, 8 POCKETS STEEL. 61099, HUBCAP USED, 15", 98-00, TOYOTA, SIENNA, SPARKLE SILVER, 8 POCKETS WITH RING & ENGRAVED LOGO IN CENTER, 8 PLASTIC CLIPS & WIRE RING. 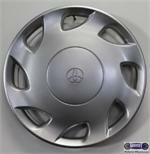 65162, Used Rims, 15X 6-1/2, 5 LUG, 112 MM, 95, MERCEDES, E-CLASS, E300D, E320, E420, E500, 8 POCKET, ALLOY. 7054, Hubcap used, 15", 11, FORD, FIESTA, SPARKLE SILVER PAINTED, 8 POCKET, 4 LUG NUT HOLES, BLUE FORD LOGO, HELD ON BY LUG NUTS.LUG NUTS. 7054, Hubcap used, 15", 11, FORD, FIESTA, SPARKLE SILVER PAINTED, 8 POCKET, 4 LUG NUT HOLES, BLUE FORD LOGO, HELD ON BY LUG NUTS. 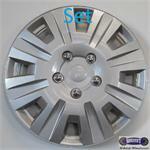 E-2, Hubcap used, 14", 60, CHEVY, PASS, POLISHED, 8 POCKETS, TWO FLAG LOGO, SNAP IN OR METAL CLIPS.